This ginger spelt cake has fiery bits of stem ginger pieces in the cake. It’s made with spelt and whole wheat flours for a wholesome cake with earthy flavors. Preheat the oven to 325°F/170°C. Line a 10-inch (25-cm) loaf pan with parchment paper. Remove the stem ginger pieces from the syrup. Finely chop the ginger pieces. Reserve the syrup for the glaze. You should have approximately 1/4 cup (60 milliliters) of syrup reserved. In a medium bowl, sift together the flours, baking powder, cinnamon, allspice and salt. Set aside. In a large bowl, using an electric mixer on medium speed, cream together the butter and sugar until it is light and fluffy, about 5 minutes. Turn the mixer to low speed, and add the dry ingredients into the butter mixture and mix until combined. Add in the egg, milk and vanilla and mix until just combined. Pour the mixture into the prepared pan. Bake in the middle of the oven for 25-30 minutes, until the top is a light golden brown, and a toothpick inserted into the middle comes out clean. Remove from the oven and allow to cool on a cooling rack. In a medium bowl, mix together the reserved ginger syrup and powdered sugar. Add in the lemon juice one squeeze at a time, until the icing is the consistency of a thick syrup. I used the juice of 1/2 a lemon, but the exact amount will depend on the amount and consistency of the reserved ginger syrup. Drizzle the icing over the cooled ginger cake. If you would like, grate lemon zest over the cake. I did not do this in the photos because I liked the smooth consistency of the icing on top. 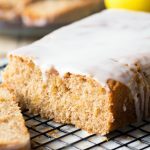 Get this recipe for Ginger Spelt Cake at https://www.theworktop.com/breakfast-brunch-recipes/ginger-spelt-cake/.